You may not have noticed it south of the border, or anywhere else for that matter, but there's been a storm brewing in Scotland for months now! A serious rift has appeared within our Scottish philatelic brotherhood and all because of cute cuddly pandas. 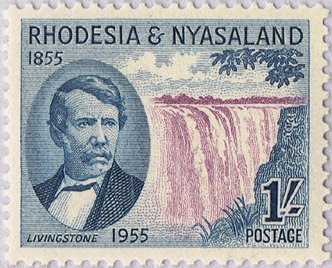 You see, 2013 is the year in which we mark the 200th birth anniversary of David Livingstone, a famous son of Scotland. Unfortunately, this anniversary was deemed unworthy of a Royal Mail special stamp, and the man's devotees had to make do with an expensive commemorative Smilers sheet. Adding insult to injury, the Scots themselves then chose to ignore Livingstone and go for the centenary of Edinburgh Zoo as the main theme of all special items prepared for the annual Scottish Congress. 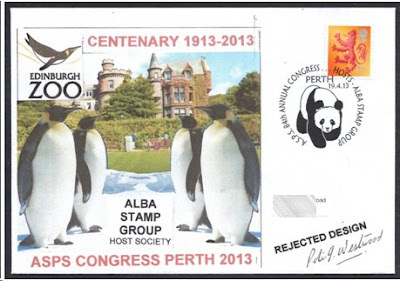 That's how we ended up with pandas on post-as-you-go sheetlets and postmarks, and penguins on the special cover. Of which, by the way, I can hereby show you the unadopted first essay! Never afraid of a clean fight, the pro-Livingstonians hit back with a special booklet on their man, written by my good friend and fellow club member Peter J. Westwood (yes that's right, the designer of above shown penguin cover!) with the participation of the nation's main Livingstone expert. 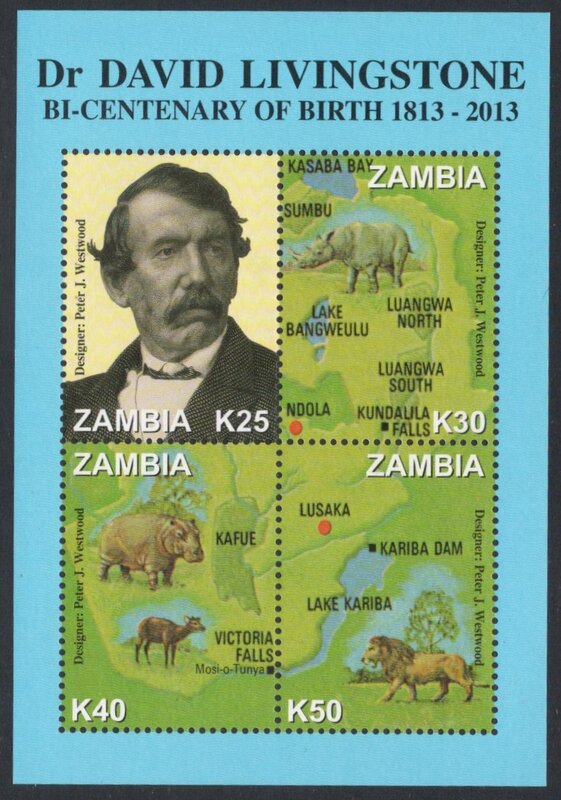 It's actually quite nice, and would work perfectly well as a starting point for a thematic collection on Livingstone. 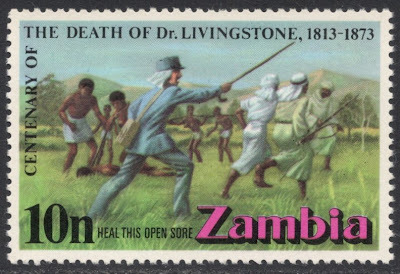 It basically tells the man's life story and lists the main Livingstone stamp issues which deal with certain parts of his life. We find therefore examples on stamps of Livingstone the Missionary, Livingstone the Explorer, Livingstone the Medicine Man, and Livingstone the Anti-Slavery Messenger. 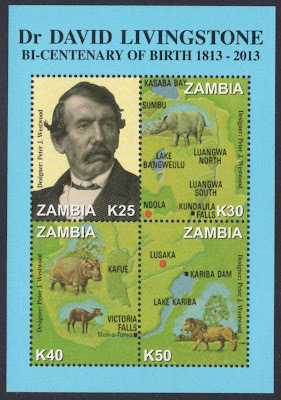 The booklet also shows what has already become a major modern rarity: the 2013 Zambia miniature sheet marking the 200th birth anniversary. Could it be that the pandas ate them? 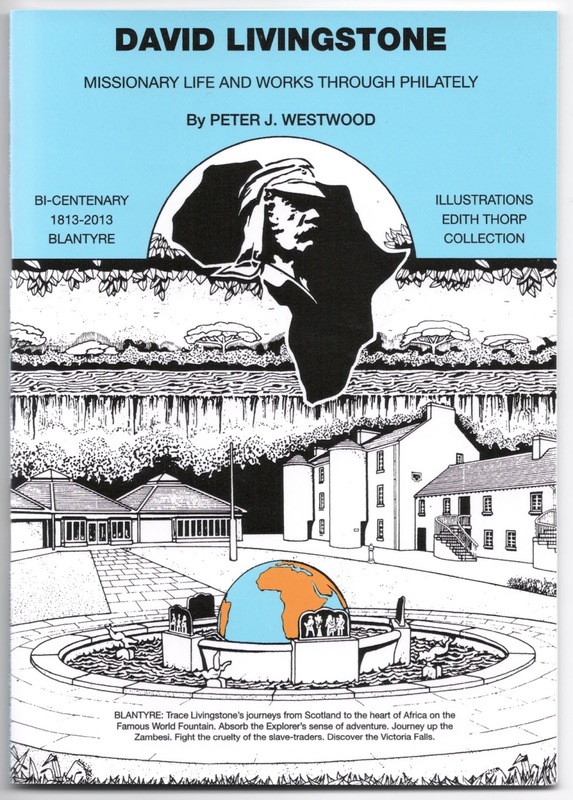 PS Shameless plug: if you're interested in the booklet, I believe the author still has a few left, so you may contact him on peter.cairnsmore1 @ btinternet.com without the spaces. Well, to be fair, it didn't stop them issuing a stam,p in the 1970s! By the way, I have a few DBZ queries. Could you email me at rerrick @ btopenworld . com without the spaces?